I'm working on a small side project with a friend. This was just the first round of concepts. Of course, my feeble brain went on auto-pilot and immediately began getting dangerously close to a Todd Harris Tak painting. I tried to steer away from that once I realized it was happening. That's what thumbnails are for though, I guess. No voice narration this time...got sick of hearing my own voice. Thank you very much for visiting my blog. yours seems to me to be fantastic!!! great clip man - love the colors! Fabulous work Marco. I'll be back around to see how your project goes. Good luck. Hey Marco, you have a Beautiful quality to your artwork. Love the style and whimsical brushwork. Bravo! I love your art Marco. I'll put your link in my blog. See you soon. Hi MARCO,fabulous work,I love your art.I like thanks for that video!!! dang those are really great- I see what youre talking about with the todd harris, but rest assured- you cant help being you! I really like these. Also on a side note- Im sure you checked out bisleys batman vs judge dredd, but if you havent... bisley at his best...! Arkham asylum is definitely really awesome though...ciao. I do texturing post. I will usually select a value range from the texture and lift it onto another layer and HSV change it or apply a soft light to that selection. Love your work. You have a lot of talent and I really appreciate your kind comments on my blog. Will definitely be back. This is really nice Marco. Love this. Hooray for idea-generating! Happy New Year my friend! Great stuff on your blog! Just stunning! Wonderful work, drooling over it! Look forward to seeing all your new work in 09! oh, this is amazing!!! I love!! Kelly - Believe it or not, I've never seen Star Wars (yes, really). Although, your comment made me look up Ewok Villages...damn, it is similar isn't it. I'll try to move in a different direction. Awesome stuff! Thanks for checking out my blog! Look forward to visiting yours in the future!!! Love the colors! nice work! and thank you for your comment! Hey Marco . . . SO COOL MAN! I'm going to watch that again later . . . and not just for the music! That is really nice. I like it. Sorry about that, Bog. I'm apparently a felon for violating international music copyright law. YouTube warned me that the video would not play in some countries...I just didn't know which ones! Nice music choice! Ha! 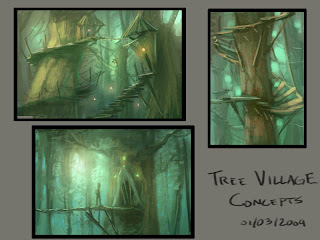 Cool concepts too!